Join Interstice Architects for PARK(ing) Day 2012 this Friday, September 21st in front of Public Bikes and Harrington Galleries at our installation: “Lighter than Air!” This year, we’re going light-weight and “floating” new ideas for our Parking Day installation, such as inflatable furniture, a floating balloon lawn, and an Icarus Bike courtesy of Public Bikes. We’ll also have delicious Malaysian Street food by mamakSF! We’d love for you to stop by and say hello to the IA team, and of course, make sure to check out all the great PARK(ing) Day installations that are sure to be going on in the Mission District this Friday. We would also like to extend a heartfelt thank you to Rebar for their organization of PARK(ing) Day – what is now a worldwide event! Interstice Architects’ photostream on Flickr. IA was happy to assist La Cocina in preparing for the San Francisco Street Food Festival which took place this past Saturday in the Mission! We helped the festival with the design and construction of over 120 platform benches made from almost 500 locally sourced recycled wooden palettes. We hope you had a chance to visit the festival, and click the link above to take a look at our Flickr set of photos from the event. We would like to thank all the food vendors, volunteers, and especially La Cocina for organizing another successful food festival! 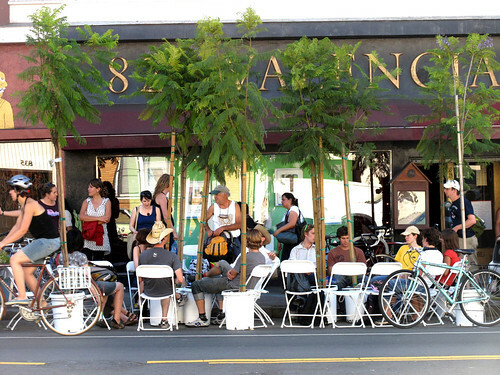 Come join Interstice Architects in front of 826 Valencia in the Mission for Park(ing) Day San Francisco 2011! The volume of just one parking space is 800 cubic feet – which is equivalent to the minimum soil required for an urban tree to thrive. Using recycled wood palettes, we are installing a temporary story space/nursery, and in deference to the corsair spirit of our friends at 826 Valencia, our paarrrrk-let prototype will proclaim our proclivity for parking-space piracy in proper privateer practice. The parklet re-uses a waste stream material to create a multi-tiered space for people to lounge ‘on deck’ in the shade of an urban tree. The space defined by the outer edge of the pallets represents the soil the tree needs to develop a healthy and stable root system. Our parklet illustrates not only how a parking spot can be transformed into an urban nursery, but how a temporary nursery space for a tree can also become a community social space. Tapping into our interest discussed in former posts regarding our research into Public Green Networks, we envision a system of both permanent and temporary urban nursery spaces that add a new dimension of verdant social space to the evolving ‘green’ urban fabric of the city. More on this idea in posts to come. So please, make sure to stop by our paarrrrk-let and check out our park(ing) day page on the Parking Day DIY Network, where you can find mapped locations for parking day installations across the city, and take a look at all the different people and organizations participating in Park(in) Day this year! We would like to extend a special thanks to Rebar for their excellent organization of the worldwide event, and for starting this great tradition 6 years ago! SF Street Food Festival 2011, a gallery on Flickr. Recently, IA was pleased to get involved and help La Cocina with their 3rd Annual San Francisco Street Food Festival — an event that showcases some of San Francisco’s best food from restaurants from across the Bay Area. Held in the lively Mission neighborhood, the festival features stalls from over 60 local restaurants and chefs, live music, drinks, and local vendors. The IA office helped La Cocina with the planning, organization, and assembly of temporary dining furniture made from easily sourced waste-stream materials, using items such as milk crates, plywood, and recycled wood palettes to construct tables and seating pods. Check out our Flikr Gallery, linked above, for photos of the festival and some of the furniture in action, and make sure to visit La Cocina’s website for more information on the Festival and their own incubator kitchen programs. This past September, San Francisco held it’s annual “Architecture and the City Festival”. This year’s theme, “Investigating Urban Metabolisms,” asked participants to “… take an in-depth look at hidden and emergent systems that generate form, movement, growth and entropy in the city.” Taking part in the event, our office organized an exhibit titled “Public Networks of Urban Access,” which presented a variety of pedestrian open spaces developed in the city within the past 20 years, and analyzed the various emergent relationships that exist between them. The exhibit interprets the festival’s theme of “Urban Metabolisms” by comparing the networks formed by these spaces to the various systems of the body and the roles they serve as parts of a unified whole. The aim of this process is to find creative ways to de-familiarize these sites so new interpretive value can be found – value which may guide future design strategies affecting the public space of the city. The detailed conditions, specific to each site, provide a broad basis for investigation, linking the various open spaces geographically, ecologically, socially, and historically. Pedestrian Networks function in the body of the City in a multiplicity of ways. They are designed to accommodate the human body, but also function environmentally and experientially. As a CIRCULATORY system, they get us from here to there; as a RENAL system, they filter water and air, improving our health and sustaining us; and as a NEURAL network they communicate the mutable natures of the urban environment – the haptic, visual, auditory and olfactory. This analogy provides us with the impetuous to explore the “comparative anatomy” of several recently improved San Francisco pedestrian networks and is meant to stimulate further exploration through estranging the familiar – revealing new perspective so that we can discover (experience) them anew. The projects presented, all of which provide access to wild landscapes, sensitive areas and waterfront, are intentionally diverse, and are categorized into one or more of the following: Topographic Access, Pedestrian Streets, Water Access, and Access to Sensitive Habitats. With each of the twelve projects represented we provided a field of comparative data, an abstract, communicating a brief history, the scope of the contemporary improvement, plan and sectional graphics, and an example of the designer’s vision or other experiential material – all meant to educate, awaken and inspire further exploration through self-guided visits to the individual projects. The projects are mapped onto various aspects of San Francisco to contextualize them in relation – to water, sound, neighborhoods, and other urban metabolisms and emergent systems- all play a role in how we know and understand these places. The projects selected and showcased are a small selection of the emerging network of pedestrian access and pedestrian-centered environments that have been designed, built and improved upon in the last two decades in San Francisco. The emerging pedestrian network is one that highlights the changing priorities of urbanites nation-wide, newly oriented toward more ecologically diverse experience in the urban environment. The newly designed and built artifacts and architectural elements are bringing us into closer contact with lost ecological systems, habitats and wilderness, and are sheltering us from the effects of the automobile. Through their re-design, sidewalks, streets and parking areas are being reclaimed as places for water, plants, birds, insects and simultaneously, as places for people. To make matters even more complex, the lack or presence of humans on a site becomes a variable to wildlife as well, thus developing reflexive relationships between humans and wildlife. The city’s open spaces have been developed organically – often shaped by circumstances unique to the era in which they were built. The histories of these sites then record, in part, the history of the city’s development. But a new impetus in public space design which has prioritized returning sites to their states before the settlement of San Francisco inverts the relationship of history and site by using the space of the public site to explore the natural history of the Bay. Since the city was settled so rapidly, it is uncertain what exactly the San Francisco landscape looked like ages ago, or how biotic communities functioned prior to human settlement. Public efforts are returning most of the ecologies studied to their “native” states. These sites become forensic in nature. They tap into the growing interest in researching the ecological past of what are now dense urban centers. New open space projects that leverage the findings of this research establish connections between the pedestrian and the natural history of the city and provide a new context within which to situate proposed projects that link the various open natural spaces within to city creating new systems or supplementing existing ones. Sites which excavate the natural past for present populations have substantial projective value, and concerted efforts on the part of ecological historians and designers to work together could pay high dividends in enriching urban public spaces and creating more sites where nature may re-establish itself within the confines of the city. This is a theme we have investigated in past projects such as our investigation, “Agri-Structure | Eco-Structure,” and is one that we firmly believe carries great potential. Another dimension relating to the pattern of development of San Francisco’s urban spaces is the organic, piecemeal process in which this network has taken shape. While San Francisco boasts a wide range of scale and size in its public open spaces, these parks, alleys, and pockets of green are most often discrete objects – relationships with other open spaces are either non-existent or have evolved through creative temporary programming often organized in grassroots fashion by city dwellers (take for example, the many small farmers markets that transform otherwise quiet streets between neighborhoods into temporary pedestrian public spaces). This pattern stands in stark contrast to cities such as Boston, which have historical precedents for large public space meta-projects (ie, Olmstead’s Emerald Necklace, and the recently completed Central Artery Project). This is an example of a process that is the polar opposite of the pattern of open space development in San Francisco. However, while these meta-projects laudably attempt to create defined connections between multiple public spaces, the very nature of their planning and construction is disruptive, costly, and time consuming. Despite these inherent drawbacks, their scale also carries visionary portent and suggests a greater city that could leverage its emergent possibility when perceived on the macro scale. We would like to propose such a project. Given these precedents, our study’s proposal is for a project has not yet taken shape. This project would combine the discrete nature of San Francisco’s public spaces, the grassroots community involvement of the city’s population, and the vision and foresight of larger infrastructural projects. Could a planned network of temporary and permanent small scale urban spaces that collectively assist in filling the gaps between the city’s existing public urban spaces combine these three strategies successfully? Such a project could breathe new life to under-utilized spaces, find new uses for unnecessary program, and bridge successful sites with each other, creating a new layer of experience within the city. The discrete and small scale nature of each individual project would encourage community involvement and private investment into collective urban spaces. The large-scale vision of the project would ensure that these sites form relationships with existing public spaces, and create a new pedestrian experience within the city – encouraging further investment and community involvement. We believe that the San Francisco’s goal should be nothing short of being the premiere pedestrian city in the country. A pedestrian open-space network such as we propose would form the basis for a new sense of what a “landmark” project entails – monumental in ambition but without the need for monumental form. To achieve this, we believe that a new metabolism or systemic project that is connected and incremental is necessary, finally evolving into a fulfilled promise for a better pedestrian city. The San Francisco Architecture and the City Festival commences next week and we’re pleased to invite participants to both take a tour of our Mission:House, as well as view our newly completed Urban Interstice Gallery’s inaugural exhibit. As a part of the San Francisco Living: Home Tours weekend event, guests will be able to tour some of the city’s most architecturally distinctive residences. The Mission:House will be one of the homes included on the tour, open for viewing on Saturday, September 12th. The Mission:House is an 1100 sqft. “hybridizing” residence and living laboratory for a family of four (architect, landscape architect, and two daughters), who have made it their personal trial grounds for materials, light and unorthodox construction techniques. Experiments range from floors of expansive steel plates, walls of thermal plastics, and magnetic closet/display walls, to integrated passive energy strategies, ingenious waste-stream material reclamation, and high-tech thermal & solar power collection. On the street a façade of shingled glass, built entirely of reclaimed material, creates an unusual “Greenskin” of refracted light through superimposed frames. Inside a 50-foot long wall of sliding doors reconfigure the ground floor studio while upstairs an operable skylight stretches across the house to let in the sky (and rain). A 30-foot rear façade of sliding corrugated thermal plastic, looks into the timber bamboo canopy. Translucent & luminous materials imbue the small home with a sense of volume and openness. Green magnetic walls slide and swing to absorb program, while the roof integrates an organic vegetable garden, hot tub, and a 4 kilowatt photo-voltaic array into a terraced topography of modular wood tiles. If you are interested in learning more about the Mission:House, you can find more images and descriptions on our website. You can obtain more information regarding the Home Tours and reserve your spot by visiting www.aiasf.org/hometours. Downstairs from the living spaces of the Mission:House will be the inaugural exhibit of our newly completed Urban Interstice Gallery, Public Networks of Urban Access. Relating to the Festival’s theme of “Investigating Urban Metabolisms,” the exhibit showcases the emerging network of pedestrian access and pedestrian-centered environments that have been designed, built and improved upon in the last two decades in San Francisco. The emerging pedestrian network is one that highlights the changing priorities of urban dwellers. Priorities that are increasingly calling for the design of artifacts and architectural elements that bring us in contact with lost ecological systems, habitats and wilderness, and shelter us from the effects of the automobile. Through Design we are reclaiming sidewalks, streets and parking areas. Designers are finding creative ways to gain universal access to more wild landscapes, sensitive areas and the surrounding bay. The exploration of these projects will be presented in photographs, drawings and narrative falling into the following topical areas: Topographic Access, Pedestrian Streets, Water Access, Access to Sensitive Habitats. We will be curating this exhibit which will showcase a number of public space projects in San Francisco. The opening reception will be Tuesday, September 14th at 5:00 pm, with the exhibit open through September 25th. The Urban Interstice Gallery is located at 3443 26th Street, between Bartlett and Mission Streets (Google Map Link). Hours are from 2-6 pm Thursday – Saturday. Forest on Foot, originally uploaded by Interstice Architects. Our 2009 mobile installation for Rebar’s PARKing Day is published in the February issue of Landscape Architecture Magazine — flip to page 20 to read about our “Forest on Foot,” which featured 10 Jacaranda Trees, 20 white chairs, and a lot of “spontaneously dontated elbow grease.” Click on the photo above to view our Flickr Photo Set of the event. Much love to Rebar for their stellar organization of PARKing Day, and everyone that participated that made it a successful event.